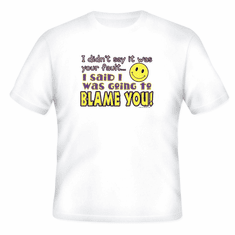 Shirt: Didn't say it was your fault...I said I blame you! Home/Our HoneVille.com Store/NOVELTY designs/Shirt: Didn't say it was your fault...I said I blame you! Available on a large selection of shirt styles, colors and sizes. 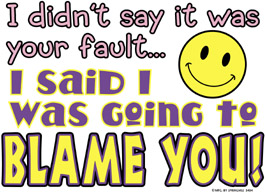 T-Shirt: Didn't say it was your fault...I said I blame you! 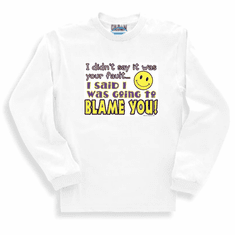 Sweatshirt or T-Shirt: Didn't say it was your fault...I said I blame you! 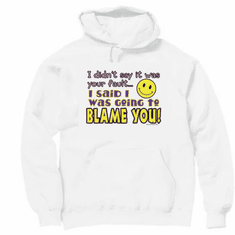 Pullover Hoodie Hooded Sweatshirt: Didn't say it was your fault...I said I blame you!